Tuna canning in the mechanized canneries of the 1950s and later was a several step process. Men and women participated equally yet held separate responsibilities. The first phases of fishing, butchering and the massive steam facilities were men's arenas as were the final phases of can sanitizing, boxing and shipping. Women were at the center where the rapid process of cleaning, boning, sorting, packing and much of quality control was completed. A flume system was designed to carry fish from fishing boat to cannery. Fish hauled in and stored on ice is directed to thawing tanks by a foot release controlled by a "tank man." Fresh fish moves directly to butchering tables. ~ from the The Star-Kist Story, company pamphlet, Starkist Foods, Inc., H.J. Heinz Co. (1962), Matich Family Private Collection. Heads and tails are butchered. The fish are also examined and smelled for freshness. Tuna is pre-cooked in steam-ovens, 150 tons at a time. Depending on size, the tuna is cooked up to 4 hours then cooled. Originally the fish were cooled in a cooling room for ten to twelve hours. The post-war tuna plants, especially the high-tech Star-Kist Plant 4, reduced the time by half with a rapid vacuum cooler. Women clean, bone, fillet along seven 150-ft long stainless steel conveyor belt tables in the 43,000 square foot cleaning room at Star-Kist Plant 4. A full shift employed 800 women at the cleaning tables with close to 100 more women on the floor as table supervisors, floor ladies (lead supervisors) and quality control inspectors. ~ from Matich Family Private Collection. At Van Camp's Chicken of the Sea, women's hands blur as they skin, bone and clean tuna. Speed was important to make the hourly quota of 4 baskets. At the end of each long conveyor cleaning table, women inspect the fish as they feed fillets up a ramp to the canning machines. Down to their shoes, tuna cannery women dressed in white uniforms as part of the quality control protocol. 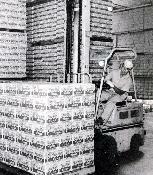 The decade after the World War II brought both technological and personnel changes to the canneries. Hand canning was phased out and replaced with packing machines. Also at that time, some Japanese families interned during the war, returned to the area. Here, in 1960 at Van Camp's "Chicken of the Sea" a woman packs tuna by hand. In a separate section of the massive Star-Kist Plant 4, both men and women spot checked filled cans. Variations in color and amount of fish were monitored. Also noted was the level of added liquids - vegetable oil, chicken broth, or water. This undated photograph may be from the late 1950s. Here men catch packed cans of tuna in large retort baskets to bring them to sealing, washing, and steam-sterilizing stations. In large retort baskets, cans are heated in giant steam ovens at 242�F for 75 minutes. This undated photograph may be from the late 1930s. Pre-war photographs offer a nostalgic image of the early phases of an industry that, only a decade later, became a sweeping commercial effort. In 1952, Star-Kist became the flagship of the industry with its new Plant 4 streamlined facility. In an 8 hour shift, the women and men employees could produce 14,000 cases. Tuna cases were stored off site in warehouses before being shipped by truck and rail. During World War II, the night shift army rations production was never warehoused; it was loaded directly onto train cars waiting on tracks at the back of the cannery row. The U.S. Tuna Industry, A Report by the Editors of Good Packaging, complimentary booklet of Star-Kist foods, Inc. Terminal Island, CA. 1963.